and all good book stores. Oblong Books, Montgomery Row, Rhinebeck, 7:30pm. Launch party and panel discussion, to include Tommy Ramone, Fred Smith, Elda Gentile, and Eric Weissberg. Refreshments will be served. Panel discussion with Arlene Smith (The Chantels), Peter Stampfel (Holy Modal Rounders) and Seymour Stein (Sire Records). ALL HOPPED UP AND READY TO GO appendices, with MP3 playlists and Google Maps to accompany each chapter, are being uploaded every Wednesday. I was halfway through my first two-hour interview with the guitarist, producer, songwriter, journalist, and author Lenny Kaye, about as educated and enthusiastic a student and participant of the New York City music scene as anyone could ask to meet. Ostensibly, we had reached the point in our conversation where we were talking about the New York Dolls and why, despite their considerable influence over both the short and the long term, they had imploded so quickly, barely making it through two albums. Indeed they do. When I set off on the idea of writing a musical history of New York City, I envisioned a book that would start with the vaudeville impresario Tony Pastor and trace the birth of the American music business to the back rooms of the German and Irish beer halls along the lower Bowery—home of the original b-boys—in the years directly after the Civil War. 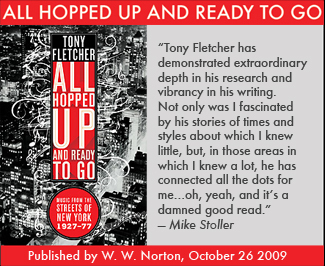 By the time I had sold the idea to a publisher, half my initial research appeared to have been thrown out the window, and we had settled on a book that would begin eighty years later, after World War II, and end at the present day—in a New York City whose music scene, I felt then (and still believe now), had been rejuvenated by a fresh influx of musicians and entrepreneurs in the aftermath of that great New York tragedy, 9/11. “Fletcher’s commentary melds very different cultures to shows interrelationships and how new genres built upon the foundations of predecessors. This makes for an ambitious agenda whose demands Fletcher meets magnificently. 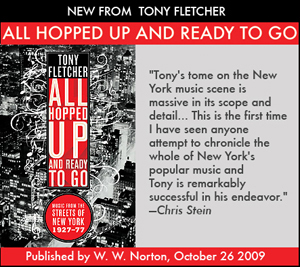 Anyone interested in popular music and the rich cultural heritage of New York—indeed, of all of the U.S.—should read this book.” – Booklist. 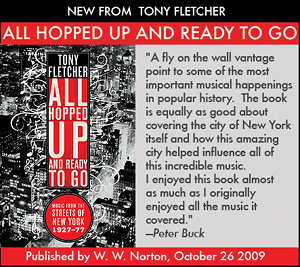 “Fletcher provides compelling and convincing evidence on why New York and its unique cultural mix were essential to all of these scenes. 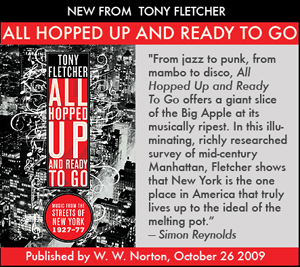 He studies in detail how music that developed on the streets became important commercial genres and examines the intersections of all the styles over the 50-year period he discusses.” – Library Journal. Question posed by a cabby in York when he learned i live in Woodstock: "Who was the youngest person to play Woodstock 69?" No cheating.